When I get in touch or meet a couple for the first time, I always try to do my best to listen to them, to understand their personal aspirations and tastes. Making a dream come true is hard work, but when you are back home after your wedding in Tuscany, and I read your reviews, it is a pure joy for me to hear that I have contributed to making your wedding day unforgettable! 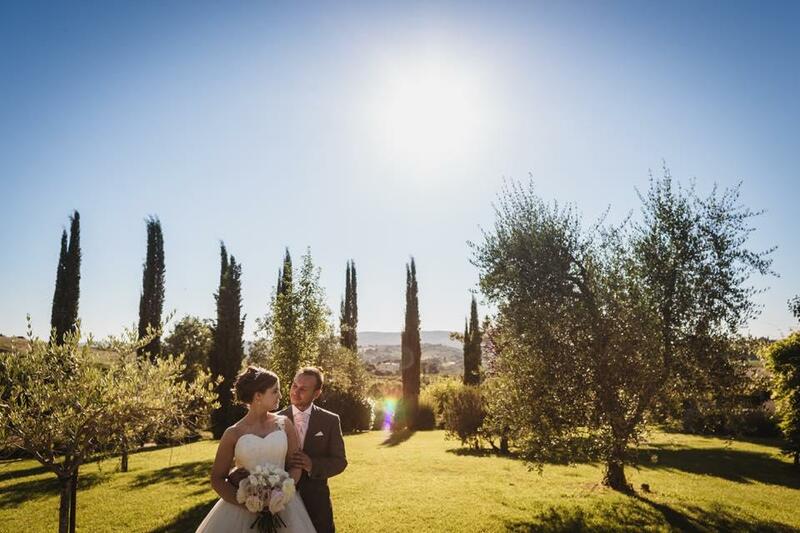 Services: Full Service: wedding venue (Villa Le Fontanelle), paperwork, official translation during the civil ceremony, wedding photographers, flower decorations, transfers for the guests, caterer, welcome dinner, music for the ceremony and for the party, fairy lights. Thank you so much for all your hard work in making our day so Special and Amazing! We really cannot thank you enough for everything you have done to make our day so Special and Personal to us. The day went above and beyond our expectations and this was all because of you! We hope to see you next year whilst on our honeymoon! 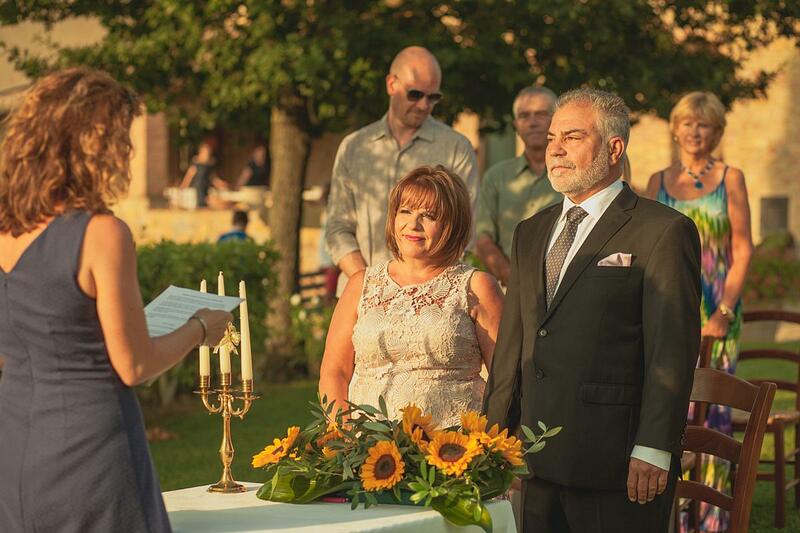 Services: Medium Service: paperwork, official translation during the civil ceremony, , hair and makeup, flowers, photo service, Wedding toast and gelato. 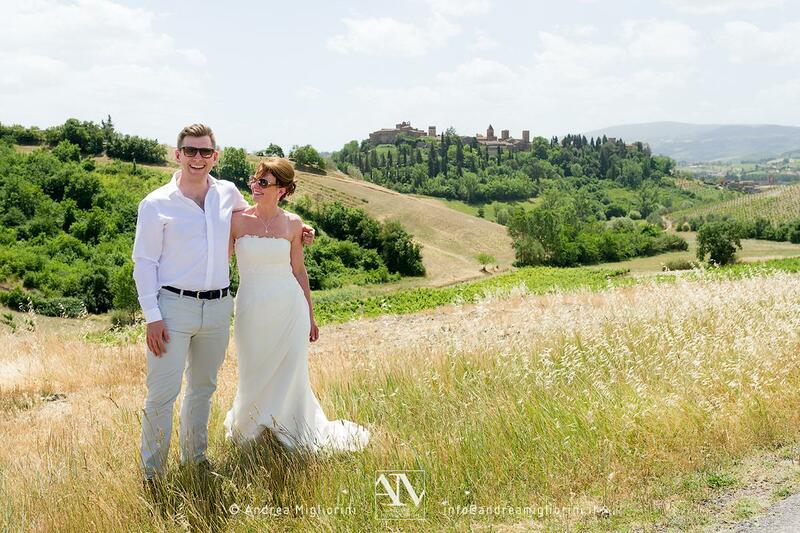 Firstly we must apologise for not contacting you sooner to thank you for planning and working with us on our very special Wedding Day in Tuscany. 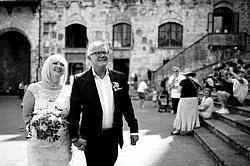 We had the most wonderful day and we loved the ceremony and the special gifts we received which were a a complete surprise and a wonderful gesture from the Town Hall. We plan to get the picture framed as soon as possible and have already framed the beautiful certificate. 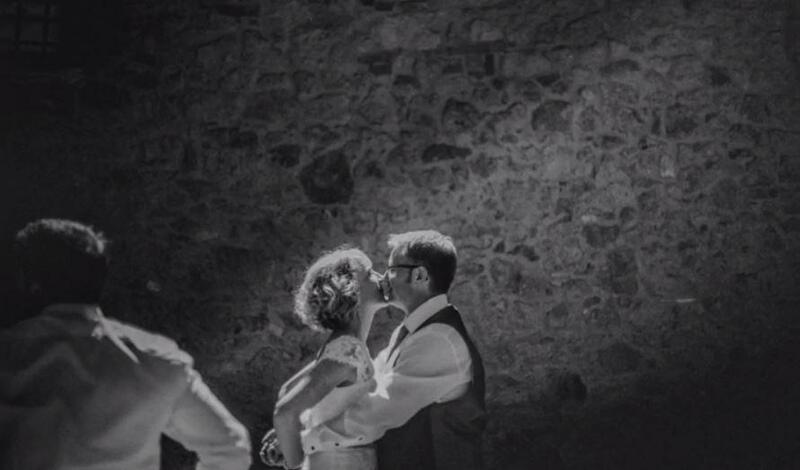 Our guests said it was the best wedding they had ever attended (apart from their own) and the comments since seeing the photos and video were such that if you plan to get married this is the way to do it and in such a beautiful place. We are hoping to come back to SG next year for our Anniversary so we will come by to see you if you are around and of course we will give you our recommendation as it was a truly wonderful day with memories we will treasure forever. We look forward to hearing from you seeing you in the future. Thank you so much for the email. Hope you are well. We are, but we are missing San Gimignano so much. The pictures are so amazing, we're extremely happy with the outcome. Vincenzo did a fantastic job. Please let him know, that he can of course use pictures for both his page, and also to send to the places mentioned. We will gladly review him, but cannot find review section. Can you point us to it? Services: Medium Service: paperwork, official translation during the civil ceremony, Music for the wedding ceremony, hair and makeup, flowers, photo service, Wedding meal. I wanted to email you to thank you for such a special day for us, we enjoyed every minute and although I'm completely disorganised you managed to keep everything on track. We loved the harp player and the meal with Max was fantastic. Services: Full Service: wedding venue, paperwork, official translation during the civil ceremony, wedding photographers, flower decorations, wedding lunch, hair and makeup, transfers, welcome dinner, wedding car, wedding party, music for the party. 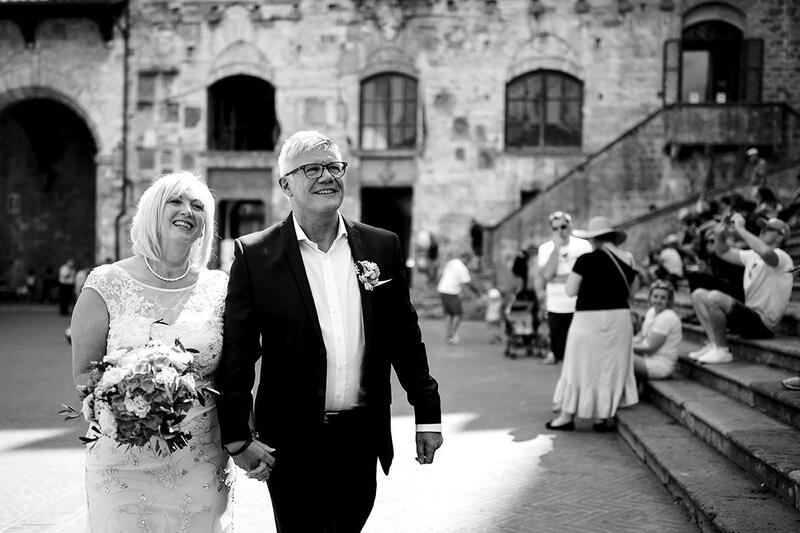 Services: Full Service: Wedding venue, accommodation, full guidance and assistance with the paperwork for the Wedding Ceremony, Hair and Make up, flowers, photo service, music for the ceremony, wedding car, wedding meal, guests transfers. We hope you are well. Ally and myself were wondering when would we expect to get the photographs? 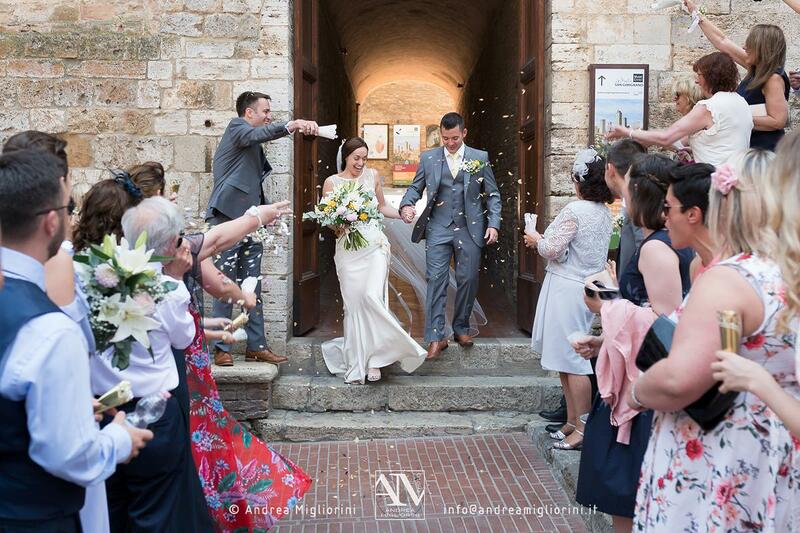 We would also like to thank you again for all your help in planning our wedding, Ally, myself and all our guest had a great time…it truly was a special day in Tuscany! Le 15 septembre 2016, nous avons eu le bonheur de nous marier à Grève dans la magnifique région du Chianti. Cette journée de rêve nous la devons en grande partie à Elisabetta qui a déployé tous les efforts requis pour nous permettre de réaliser ce beau projet de vie. La préparation et la réalisation d’un mariage à l’étranger demandent la prise en charge de nombreux dossiers pour garantir sa réussite (ambassade, mairie, organisation du site, musicien, traiteur, interprète, photographe, légalisation des documents, fleurs, décoration, transport, etc.). Il est essentiel d’être accompagné par des experts sur place qui ont les compétences, les ressources et les contacts pour réaliser ce type d’événement, ce que l’agence Special Days a accompli avec grand succès. Ce qui résume le mieux notre expérience avec Special Days, c’est le nombre d’étoiles (5) que nous lui avons décerné. Merci Elisabetta pour ta disponibilité, ton professionnalisme et ta passion que tu nous as transmise tout au long cette belle collaboration. Nous te souhaitons plusieurs autres réussites ! Services: Full Service: Setting for the symbolic ceremony, floral design, hair styling and make up for bride and bridesmaid, music for the ceremony, photo and video service, wedding reception, wedding venue. Services: Floral design and setting for the symbolic ceremony, celebrant for the wedding ceremony, music for the ceremony, hair styling and make up for the bride, photographic service, wedding dinner. My husband and I were looking for a wedding planner to assist us with our elopement in Tuscany. We wanted something small and private, but still special and beautiful. 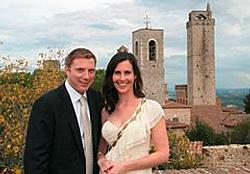 We live in the U.S and have no connections in Italy, so I googled some of the planners in the Chianti region. 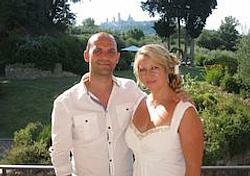 Elisabetta at Special Days replied very quickly and offered her assistance right away. 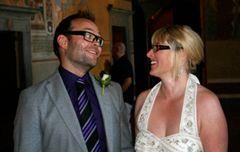 She gave us many options, suggestions, and personalized ideas for our wedding that made the process go very smoothly. Elisabetta contacted and set up all of the services we needed for that day, including a harpist! Everything was very timely and professional, so I did not stress leading up to the event. We had a couple of things to finalize upon our arrival in Tuscany, but we fully trusted Elisabetta in selecting some final flowers and decorations. Everything turned out absolutely beautiful and Elisabetta was not only the officiant, but she coordinated and set everything up perfectly on that day!! We are so thankful for our gorgeous, amazing day in Tuscany and have been receiving so many compliments. 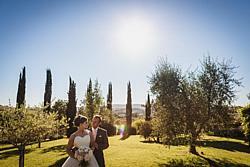 Special Days in Tuscany has our highest recommendation!!!! Services: Full Service: paperwork, official translation during the civil ceremony, wedding venue, welcome dinner, reception, music for the ceremony, Dj-set for the party, wedding car, flowers and decorations, photo and video service, photobooth. 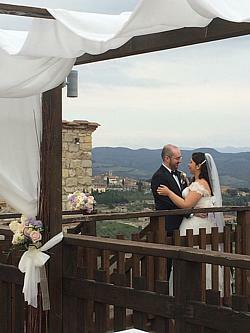 We found Elisabetta did a great job for us and made sure we had everything. We had no experience with Wedding Planners, especially one in Italy! 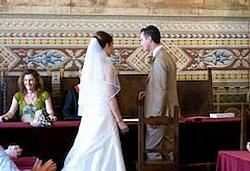 However, Elisabetta understands English very well and also the requirements for UK citizens to be married in Italy and everything that we needed was explained very well. During the weekend Elisabetta worked non-stop and was very accommodating making sure we had everything that we needed and that everything was prepared. She clearly knows what she is doing and is very experienced. 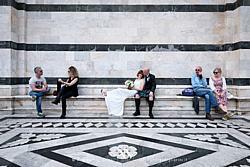 Elisabetta is very sociable and a calming influence. She is very easy going and we like her very much. 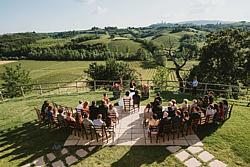 We would highly recommend Special Days in Tuscany. 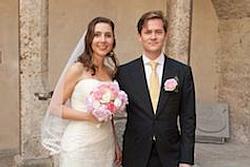 When we came across Elisabetta we were searching for a wedding planner. 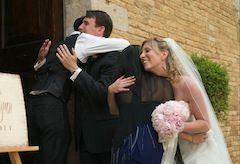 Several months later we celebrated our perfect wedding and emerged with a new friend. 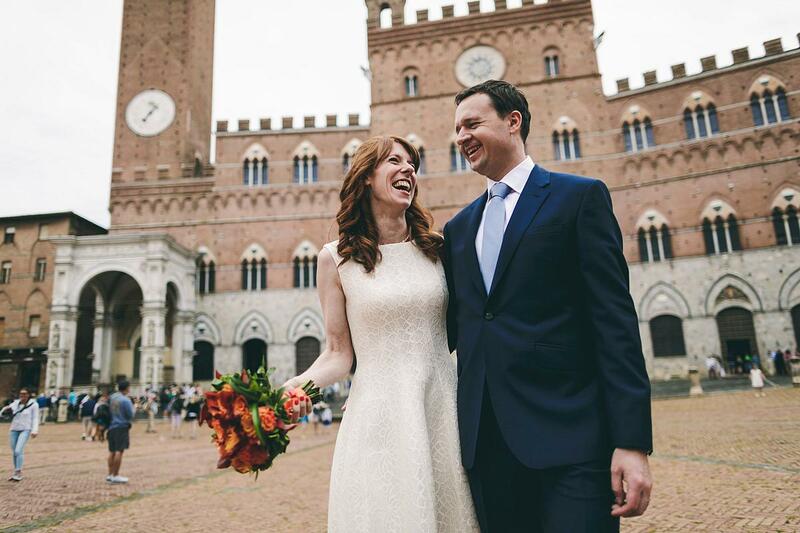 Elisabetta was the fifth or sixth wedding planner we had contacted with our specific request – find us a villa big enough to house our family for a week where we could also host our wedding reception. Oh and please find a secret spot where all you can see is beautiful Tuscan countryside in every direction. Where the others failed Elisabetta delivered. She paid attention to our requests and searched until she found the perfect place. Just as we’d requested, it was a quiet out-of-the-way location and she felt the owners were the kind of people we could work with. Since we were on the other side of the world we put all our trust in Elisabetta. We took her advice when it came to the caterers, a hotel for the days leading up to the wedding, the restaurant for the pre-wedding dinner, the cafe for the post-wedding drinks, the florist, the photographer and more. All came from her recommendations based on her contacts and her local knowledge. And there wasn’t a single thing that didn’t live up to her promise. In fact even though we’d spent months dreaming about our perfect wedding day there were many things that exceeded our expectations. Elisabetta’s customer service was one of those things. We’d spoken via Skype many times before we finally made the trip to Tuscany and when we finally did arrive she gave us a warm embrace and made herself available to us whenever we wanted. She took us on a tour of the wedding venue in Siena and reception venue in the countryside nearby, gave us tips for the things we needed to do before the wedding and acted as a fixer, translator and Sat Nav for our guests as they made their journey to Italy. She didn’t once appear put out by our regular appeals for help. In fact every indication was she was genuinely enjoying the process. 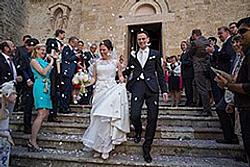 When the wedding day came Elisabetta was there every step of the way, making sure everything went to plan. She made our guests feel at ease and was a pleasure to have around. 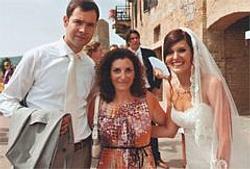 It was only by chance that we found Elisabetta and we’re so glad we did. 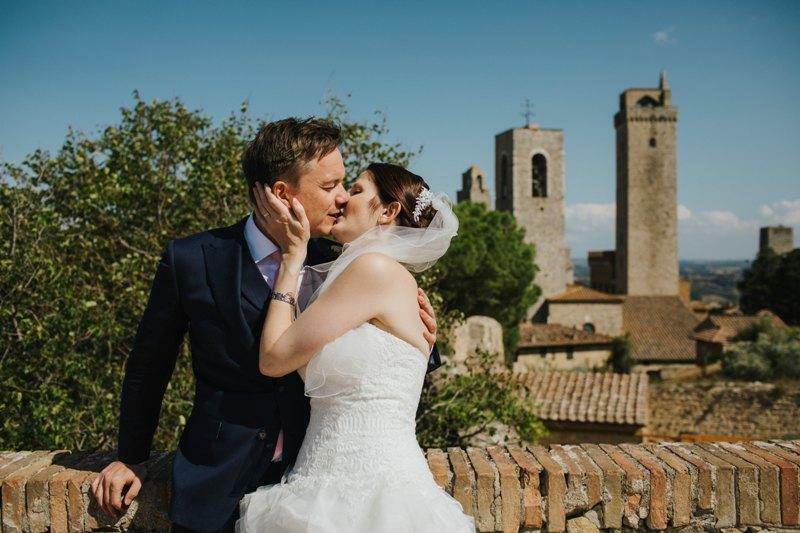 She took the stress out of organising a wedding from another country and has given us such great memories of our time in Tuscany. 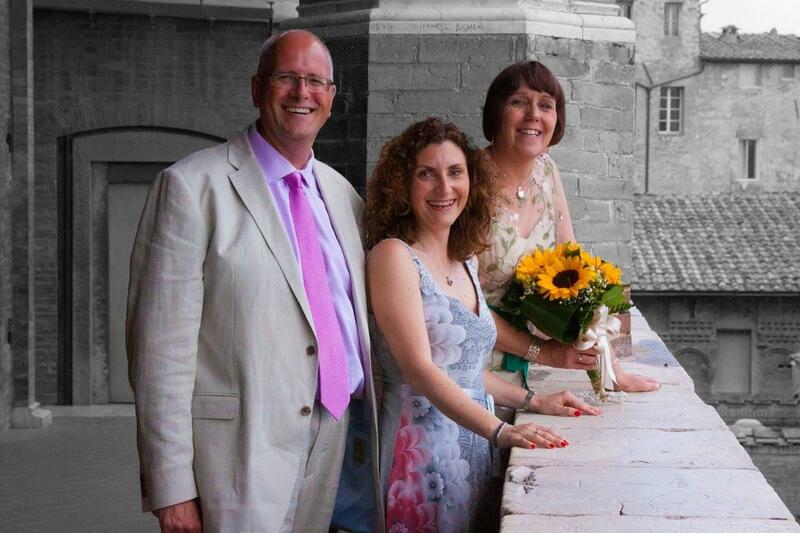 We’re already planning our return visit and look forward to catching up with Elisabetta to share memories of the day she helped to make so special. Many thanks again - I will keep in touch! Un caloroso GRAZIE per la cerimonia simbolica al Poderi Arcangelo , hai fatto emozionare tutti. 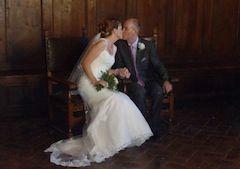 It was the most beautiful, emotional, sentimental and memorable ceremony anyone could have asked for. You outdid yourself and both Eddie and I can’t thank you enough for your beautiful words you chose. I hate to ask, but I would love to have a copy of the ceremony to have for a keepsake. [...] Once again we thank you from the bottom of our hearts!! We are back in the States and wanted to say a sincere thank you for helping to make our wedding day so incredibly special. Truly, it was magical. It’s not easy to coordinate a whole wedding over email, but thank you for being so patient and making it work!!! Services: Full Service: paperwork, official translation during the civil ceremony, wedding venue, welcome dinner, reception, music for the party, wedding car, flowers, photo service. 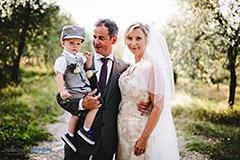 As we are starting our new family life, the memories of our days spent in Tuscany are always in our thoughts and we will cherish them forever. Services: Basic service: paperwork, official translation during the ceremony. We just wanted to say thank you to your for making our Wedding Day so special. 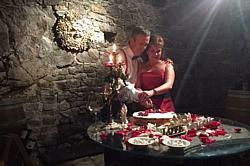 We had a wonderful time, as did our guests . it was very special. We hope to see you again when we are in Siena. Services: Full Service: wedding venue, paperwork, official translation during the civil ceremony, wedding photographer, flower decorations, toast, hair and makeup, transfers, welcome dinner, wedding breakfast, music for the party. Clare and I would like to tell you how much we loved the day you organised for us. Many of our guests commented on how perfect the day was; I replied by saying "Elisabetta did all of the hard work - all I did was pay for it"! From the bottom of our hearts we cannot thank you enough - would you please pass on our gratitude and love to Valerio, Livio and the team at Cafe Erbe. If there's anything we can do with regard to testimonials or recommendations, please let us know. Services: Medium service: celebrant for the wedding ceremony, flowers, photo service, wedding dinner. Thank you so much! These 2 pictures are beautiful and I can't wait to see the rest. Italy was amazing. The dinner you booked for us could not have been better. They took good care of us and really made our evening. Thanks for setting it all up for us! 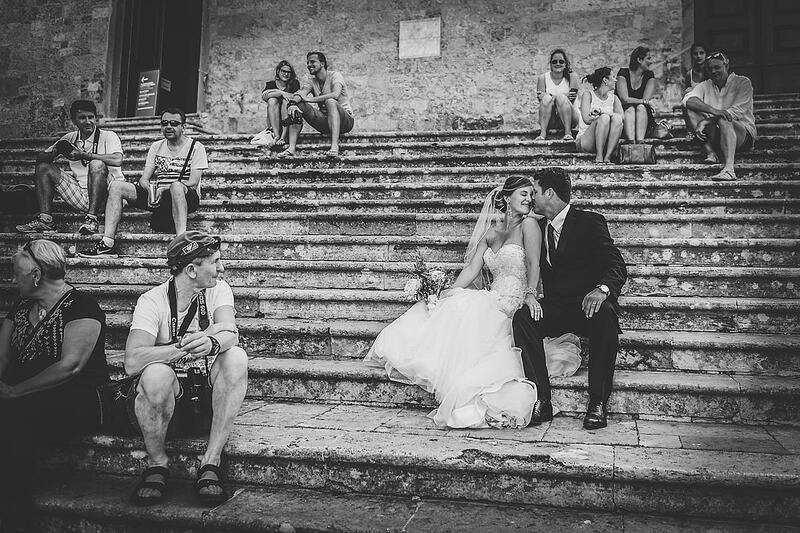 Have a wonderful wedding and tourist season! Services: Full Service: paperwork, official translation during the civil ceremony, welcome dinner, music for the ceremony and for the party, flowers and decorations, wedding photographer, wedding car, beauty services, wedding dinner, guests transfers. We hope you are well. Firstly, thank you for helping us to plan the wedding of our dreams, it all went so well and we are so thankful that we chose you as our wedding planner. Everyone was saying how wonderful you were. Services: Full Service: wedding venue, paperwork, ceremony, flower decorations, Music for the wedding ceremony, reception dinner, music for the party, photo and video service. Services: Full Service: paperwork, official translation during the civil ceremony, welcome dinner, music for the ceremony and for the party, flowers and decorations, wedding photographer and videographer, wedding car, wedding dinner, guests transfers. we have the most incredible memories of an outstanding week, topped by the most emotional, atmospheric and beautiful wedding anyone could hope for. First of all, a big thank you for making it such a special day. The amount of organisation and work that goes on behind scenes must have been incredible - I know you negotiated hard to get arrangements in San Gimignano as we wanted. [… Our guests were so impressed with the ceremony, the town hall (some said the love that was in the ceremony was so evident), and the courtyard which was a magnificent place for the prosecco. 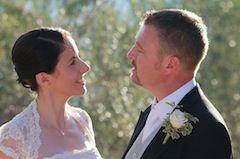 They were bowled over when they saw the setting of our villa, with the views, and the aperitifs laid out so beautifully. The food ...... what can I say?? I will email Giuseppe and his family and team, but the whole thing was delicious. He is an amazing caterer and thank you for recommending him. The guests could not stop talking about it! Your suggestions for other providers were equally successful; Valerio and Marco sounded so good, the string quartet were just right and we look forward to seeing the photographs and video in due course - they were certainly kept busy at all times! Your florist copied our photograph for the table settings perfectly, in fact they looked better than the original! Please convey our appreciation. 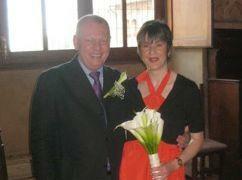 And the town hall sunflowers on the function room mantelpiece were a brilliant idea - I think you did that. Our guests summed it up by saying it was the best wedding they had attended, and some of the engaged couples said they were frightened how to follow it, the bar had been raised so high! So, a big thank you once again from all of us. Services: Full Service: wedding venue, paperwork, official translation during the civil ceremony, flower decorations, Music for the wedding ceremony, reception dinner, music for the party. 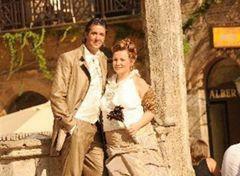 Services: Small Service: paperwork, official translation during the civil ceremony, wedding photo service. •	Acting as last-minute saviour by recomending a tailor that fixed our friend's dress very quickly and easily - we had already thought that she could not join the ranks of the bridesmaids, but then your tailor saved the dress! 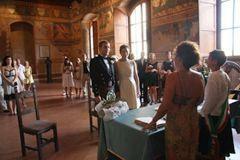 Services: Basic service: paperwork, official translation during the civil ceremony. We just wanted to say thank you very much for all you did for us, and thank you for our gift. It is such a beautiful picture! 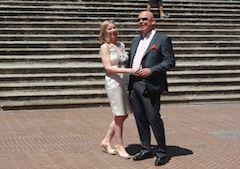 We had a fantastic time getting married in San Miniato, and really enjoyed the ceremony and setting, and thank you for making the process so easy for us. First of all and once again I would like to thank you for your great support. 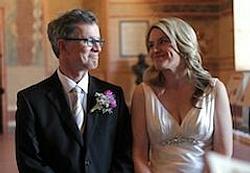 We had an unforgettable day, it couldn’t have been better or even nicer. 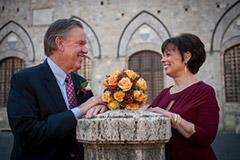 Lars and I with the entire family have enjoyed every single moment… Warm Regards from Germany to beautiful san Gimignano Lars & Daniela Pecoroni. P.S. : … the photos are absolutely AMAZING!! Services: Medium Service: paperwork, official translation during the civil ceremony, music for the ceremony, aperitif and wedding lunch, wedding car. 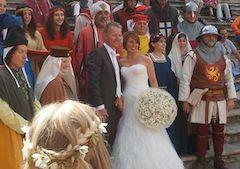 Services: Basic Service: celebrant for the symbolic ceremony. 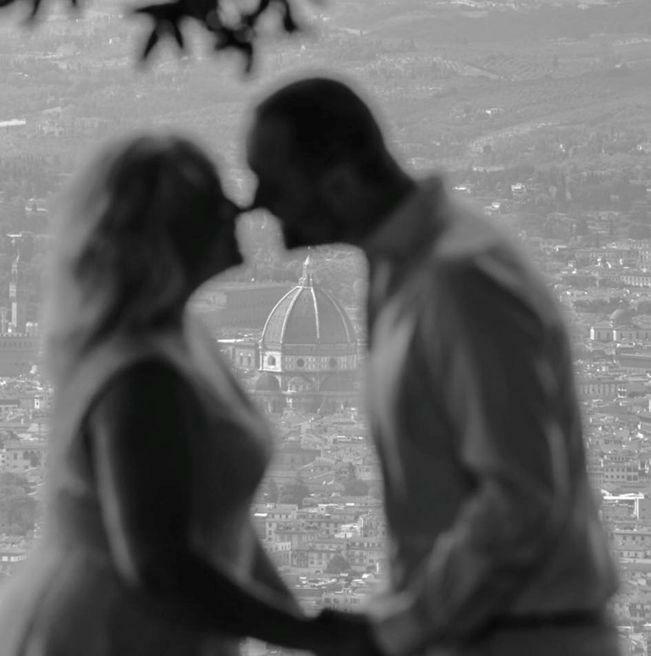 Services: Medium Service: paperwork, official translation during the civil ceremony, witnesses for the ceremony, wedding photographer, travel arrangements in Italy: hotel bookings and tours. Our experience with Elisabetta and her colleagues was exceptional. We hired Special Days to do the following: Pick us up in Rome and take us to our hotel in Florence, by way of a tour of Orvieto Arrange our wedding (including photography by Mario) in Siena Arrange a day trip to Tuscany (San Gimignano) Everything was done to perfection. We could not be happier with the process, the price and the results. We kept worrying that something would go wrong on this very special event and trip, but it all went so smoothly and so "Special" that we keep smiling as we talk about this wonderful experience. 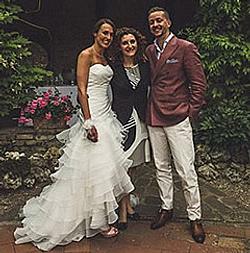 Thanks so much to Elisabetta and Claudia and Mario. You are all the very best at what you do. Services: Full Service: paperwork, official translation during the ceremony, flowers, wedding venue, wedding reception, transfers. Services: Medium Service: paperwork, official translation during the ceremony, witnesses for the ceremony, wedding photographer, flowers, restaurant, transfer. 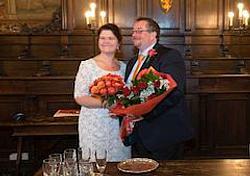 Services: Medium Service: venue, symbolic ceremony, music for the ceremony, flowers, aperitif, transfer, dinner. 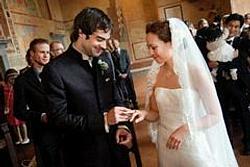 Services: Basic Service: paperwork, official translation during the ceremony, wedding banquet. 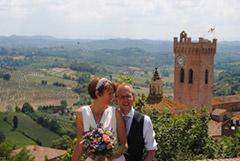 We are so glad that we decided to use Elisabetta to help us organise our big day! She is very efficient and organised, and the whole process felt very straightforward and stress free. Elisabetta's recommendation for restaurant for our wedding lunch was perfect, and several of our guests said it was the best lunch that they had ever had, and the best wedding that they had ever been to! We felt that Elisabetta took the time to help us with queries, both in emails before the wedding and in the days before the wedding, and that she was very proactive in making suggestions that would improve our wedding. We would highly recommend using her. Thanks! Services: Medium Service: paperwork, welcome dinner, music for the party, wedding photographer, official translation during the ceremony, beauty services, wedding dinner. Thank you very much for your message and not at least: THANK YOU FOR EVERYTHING! You have been the greatest, this could not have been done so well without you. Regarding that we did not know the area at all, it would have been quite hard to do this on our own. It is so nice to hear that the providers thought well of us, we appreciate that a lot. Thank you for telling us. And we think the same about them, everyone has been so nice and helpful! 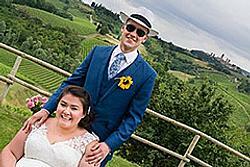 [...] The wedding day itself was totally unbelievable. 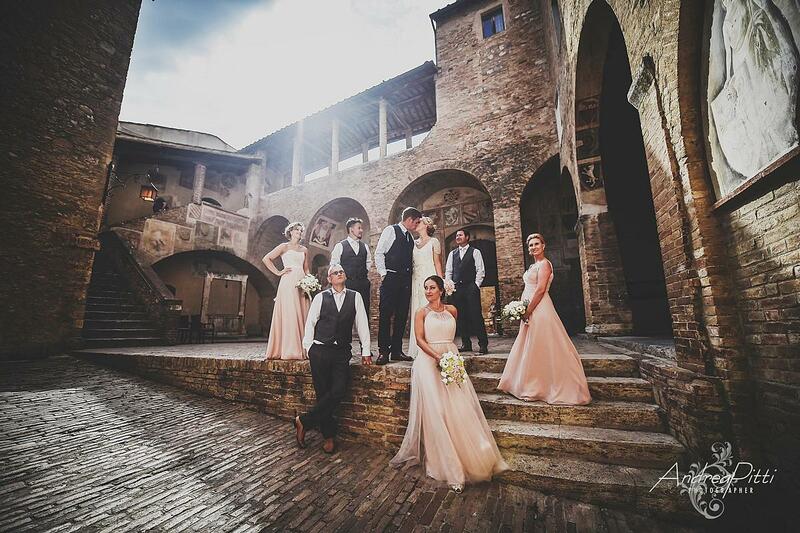 We are out of superlatives… San Gimignano is an amazing town with the most fairytale-like atmosphere. It was like being in a movie… all the clapping and cheering people in the squares, the wonderful weather, the touching ceremony, the surprising kidnapping, the photographers, dinner, speeches, - and the walk with torches to La Rocca with the dance and balloons… ahhh..what more could we wish for. I simply felt like Cinderella. Simply fantastic. Services: Medium Service: paperwork, official translation during the ceremony, wedding photographer, flowers. The other reviews are very complimentary about 'Special Days' but did not totally prepare us for our wonderful experience. The planning, organisation, attention to detail and personalised service from Elisabetta was outstanding. She listened to our thoughts and her communication was exemplary. 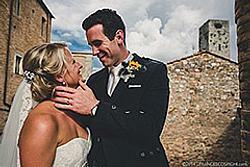 We had an intimate wedding in Cortona set in a charming town hall rich in character and the wedding room was exquisite. 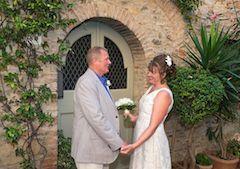 The memories of the atmospheric setting, enchanting ceremony and beautiful flowers will stay us forever. We would like to say thank you so much to Elisabetta for such a wonderful wedding, for being there to support us and for making our day truly special. Services: Basic Service: Paperwork, Translation during the Civil Ceremony. Services: Full Service: accommodation, wedding venue, paperwork, wedding photographer, official translation during the ceremony, beauty services, wedding dinner, flowers. Services: Medium Service: Paperwork, Beauty services, flowers, music for the ceremony, chairs for the Wedding Hall, official translation during the ceremony, Dee-jay service for the wedding party. Services: Medium Service: paperwork, wedding rings, flowers, beauty services, music for the ceremony, official translation during the ceremony, wedding dinner, wedding cake. Services: Basic Service: Paperwork, Translation during the Civil Ceremony, Photographer. Services: Basic Service: Paperwork, Music for the ceremony, official translation during the ceremony. 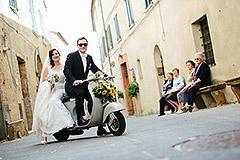 Services: Medium Service: Welcome Dinner (Ristorante La Bettola del Grillo), Wedding Ceremony, Wine tour for the Wedding Guests, Beauty Services. [...] Thank you. Kate + Ryan. Services: Medium Service: Paperwork, witnesses, translation during the ceremony, photo service. 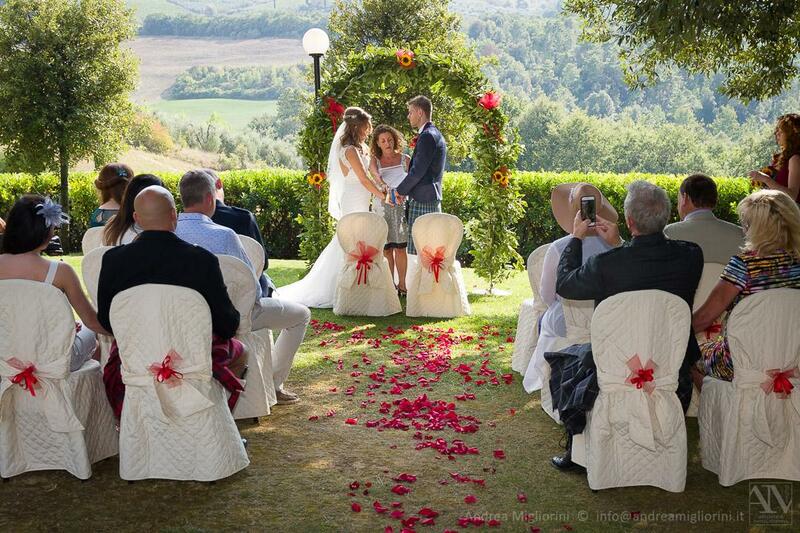 Services: Medium Service: Paperwork, Choice of accommodation and venue (Agriturismo: Croce di Bibbiano), Flowers, Translation during the Ceremony. Services: Small Service: Paperwork, witnesses, Bridal Bouquet, Translation during the Ceremony. I just wanted to thank you so much for all your help in arranging our wedding, I couldn't have done it without you! You took the pressure of me in making all the arrangements, which made the whole event hassle free! Thank you also for our lovely picture that you so kindly gave to us. 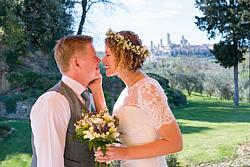 Services: Medium Service: Paperwork, Choice of venue (Ristorante Belsoggiorno, San Gimignano), Flowers, Music, Hair-dresser, Translation during the Ceremony. Services: Medium Service: Paperwork, Choice of venue (Agriturismo: Fattoria Voltrona), Flowers, Hair dresser, Beauty Salon, Translation during the Ceremony, Cake topper and confetti. Services: Medium Service: Paperwork, flowers, Transfer. Services: Small Service: Paperwork, Translation during the Ceremony, Music for reception. Services: Full Service: Paperwork, Choice of accommodation and venue (Villa Ducci, San Gimignano), Flowers, Translation during the Ceremony, wedding lunch, party, music, hairdresser, pictures.